A unique novel, looking at one the greatest battles, a battle that was a turning point in history, from many points of view, by a master storyteller. Bernard Cornwell has been thinking about this subject for years. He has long wanted to write a book about a single battle, the events that lead up to it, the actual days in the battle and the aftermath from multiple viewpoints. Agincourt, fought on October 25th 1415, on St Crispin's Day, is one of the best known battles, in part through the brilliant depiction of it in Shakespeare's Henry V, in part because it was a brilliant and unexpected English victory and in part because it was the first battle won by the use of the longbow. This was a weapon developed in this form only by the English - parishes were forced to train boys from as young as eight daily - and enabled them to dominate the European battlefields for the rest of the century. 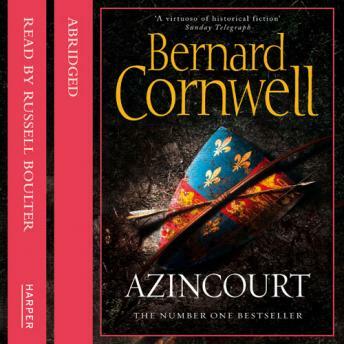 Lively historical characters abound on all sides but in Bernard Cornwell's hands the fictional characters, horsemen, archers, nobles, peasants are authentic and vivid, and the hour by hour view of the battle is dramatic and gripping.